Sometimes we see an entity in the periphery of our field of vision. In the duality of our reality, these entities can be positive or negative. They may look like a spark of light, (a soul spark and our true essence,) most often viewed as white light moving between grid realities. On occasion one sees a dark form, or forms, referred to as Shadow People. This is about consciousness momentarily moving between the grids that create our reality. There are many grid experiences simultaneously interacting with our own. Sometimes we get a glimpse into another, if only for a nanosecond. Some people are more aware, while others just move on. Shadow people (also known as Shadow men, shadow folk, or shadow beings) are said to be shadow like creatures of supernatural origin that appear as dark forms in the peripheries of people's vision and disintegrate, or move between walls, when noticed. Reports of shadow people are similar to ghost sightings, but differ in that shadow people are not reported as having human features, wearing modern/period clothing, or attempting to communicate. Witnesses also do not report the same feelings of being in the presence of something that 'was once human'. Some individuals have described being menaced, chased, or (more rarely) attacked by shadow people. There have also been reports of shadow people appearing in front of witnesses or lingering for several seconds before disappearing. Witnesses report that encounters are typically accompanied by a feeling of dread. Most accounts of shadow people describe them as black humanoid silhouettes with no discernible mouths, noses, eyes, or any expression whatsoever, though purported witnesses have also described child-sized humanoids or shapeless masses. Some reports also include glowing red eyes. Generally, they are described as lacking mass, though their specific nature varies from a two-dimensional shadow to a vaporous or distorted three-dimensional form. Their movement is often described as being very quick and disjointed; they may first move slowly, as if they were passing through a heavy liquid, and then rapidly "hop" to another part of a witness' surroundings. 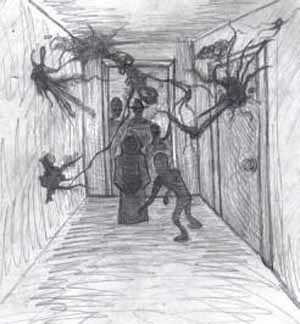 Some witnesses describe this movement as though the shadow entities they have seen "danced" from one wall to the next, or as moving around the room "as if they were on a specific track". Some accounts differ from the above and instead describe a completely black creature with red eyes, a cloak, and a gentleman's hat. This variation has become known as "the hat man". Various depictions and artists rendering have been posted on the internet. Several explanations have been proposed to explain the phenomona of shadow people. A creature/s in an alternate reality whose dimension occasionally overlaps with ours, allowing it to be partially visible. A Manifest Thoughtform (egregore), ghost or demon created by negative psychic energy and related to a places or event in which extreme emotional or physical stress/trauma has taken place. An unattended shadow or shade (mythology), said in some cultures, to be similar to that of a ghost, a flicker of a life unable to end for some reason. Several non-paranormal hypothesis for the phenomena of shadow people exist, including optical illusions or hallucinations brought on by the physiological/psychological circumstances of the witnesses. In most instances, witnesses report seeing shadow people in the peripheral areas of their vision. This areas of vision is linked to the areas of the brain that recognizes patterns, however it provides less detail to the brain than macular (center-forward) vision. This can lead to a condition know as pareidolia, in which the brain incorrectly interprets random patterns of light/shadow or texture as being familiar patterns such as faces and human forms. The same condition can also be observed in macular vision in low light conditions, or when viewing a complex but random image. A common example would be perceiving a shadow, thrown by an item of furniture in a darkened room, as being a person. Also known as waking-sleep, hypnogogia is a documented physiological condition in which a person is part-way between sleeping and waking. During hypnogogia, a person can be conscious and aware of their environment, but also in a dream-like state where they can perceive images from their subconscious. People experiencing waking-sleep commonly report the sensation of lights or shadows moving around them, as well as other visual hallucinations. A feeling of dread is also a sensation that occurs when experiencing hypnogogia. Hypnogogia is sometimes known as 'the faces in the dark phenomenon' because sufferers commonly report seeing faces while experiencing waking-sleep. Similar hypothesis have been put forward linking this condition to a number of other apparent paranormal experiences, including alien abductions and paranormal nocturnal visitations. Under the right conditions, electromagnetic fields can interfere with the functions of the temporal lobe; creating altered states of perception in which auditory and visual hallucinations can occur. Using electromagnetic fields, researches have been able to recreate many of the experiences reported during paranormal encounters under laboratory conditions, including those of shadow people. Researchers have also documented correlations between variances in naturally-occurring magnetic fields and areas where paranormal events have been reported. Certain neurological conditions, such as photosensitive complex partial seizures, have also been shown to cause sufferers to see shadow people. As long as there have been hauntings and ghostly phenomena, there have been sightings of ÔShadow PeopleÕ. These Shadow People are defined by their featureless, shadow-like appearance and the feeling of foreboding when they are present. They are nearly always a manly shape, large and with a broad silhouette and perhaps the strangest thing about them, is that they are usually seen wearing a hat of some sort. In some instances there are red eyes that seem to pierce right through you. So are they Ônormal ghostsÕ? Most people will say that they are not. They donÕt usually seem to have purpose to their visits and from the bad feelings they emit, it seems that they arenÕt benign by any means. One important observation about shadow people, that isnÕt often seen with Ôconventional ghostsÕ is that they seem to be aware of our presence. A lot of the time manifestations occur involving an entity that seems to be going about daily business, rarely do they notice or try and communicate with people. The Shadow People tend to be very aware of our presence and in fact seem like they wish to make us feel uncomfortable or frightened. Are they evil? It is tempting to say that they are, especially given the bad vibes they seem to let off. However, there is not much documentation to say that a bad occurrence usually follows a Shadow Man visitation. If fact, most visitations usually result in the apparition fading away, or disappearing when noticed. They never seem to talk or approach the witness, instead standing menacingly in doorways and corners. Some people say that Shadow People are aliens or time traveling beings. This is an interesting theory, as it suggests that not only do these entities exist, but they are frequently visitors in our lives. Why do they hang around us so much? Are we being studied? Could this be why there are so many reports of Ôfeelings of evilÕ coming from these creatures? What makes the Shadow People phenomena interesting, in the world of the supernatural, is the consistency in the sightings. No matter whether itÕs an old person or a child, or anyone in between, what they see is always the same. People on opposite ends of the world report seeing these entities on a daily basis and their recollections are strikingly similar. Whatever these Shadow People are they are definitely a regular occurrence in a lot of peopleÕs lives.